A historical perspective and current conditions are key to understanding what will happen to the orange juice market in the future if HLB-resistant trees are introduced. 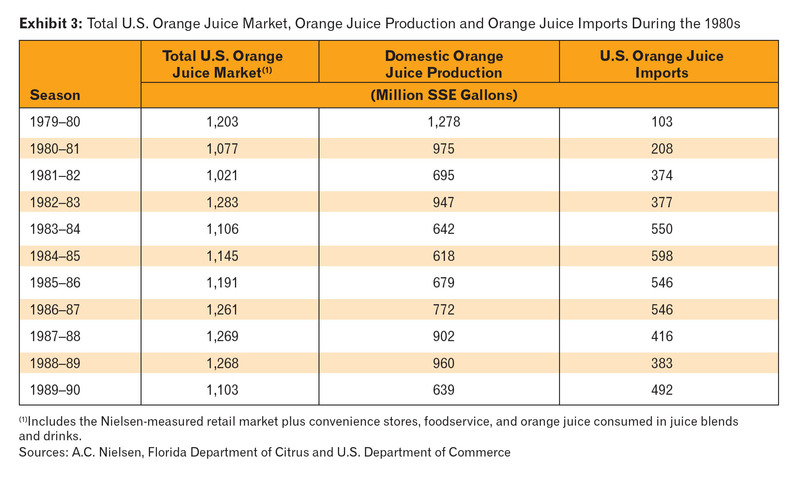 Between 2001–02 and 2016–17, the Nielsen-measured retail U.S. orange juice market declined by 50 percent, Florida orange production declined by 70 percent and retail orange juice prices increased by 53 percent (Exhibit 1). Moreover, the orange juice market is declining at an increasing rate. For the 2006–07 to 2009–10 period, orange juice consumption declined an average of 2.1 percent per year. For the 2009–10 to 2012–13 period, the average annual decline was 2.6 percent. For the most recent 2012–13 to 2015–16 period, the average annual rate of decline was 5.8 percent, and season-to-date for 10-2-16 to 8-5-17, the decline was 7.5 percent. The reduced orange juice market appears to be the result of the decline in orange juice supplies from reduced orange production and the resulting higher prices. Let’s see if that’s true. First, to the degree that Florida is not producing enough orange juice for the U.S. market, orange juice is being supplied by imports from Brazil (55 percent), Mexico (33 percent), Costa Rica (8 percent), and others, as happened during the freezes of the 1980s. But there is less supply worldwide, and that has prices up just like they were in the 1980s when freezes reduced orange juice supplies. Let’s examine what happened then. Between 1979–80 and 1989–90, Florida’s orange crop declined from 207 million boxes to 110 million boxes, a 47 percent decline (Exhibit 2). Yet the Nielsen-measured orange juice market only declined from 808 million single strength equivalent (SSE) gallons to 702 million gallons, a decline of 13 percent during this time, even though retail orange juice prices increased by 62 percent (Exhibit 2). 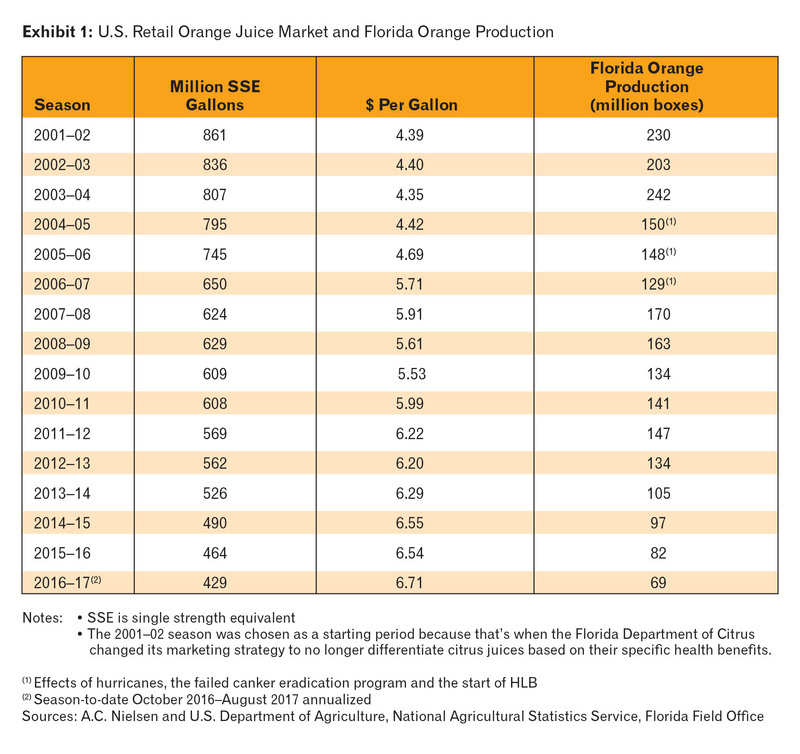 How did the Florida citrus industry suffer a 47 percent decline in orange production, experience a 62 percent increase in retail orange juice prices, yet only lose 13 percent of the market? 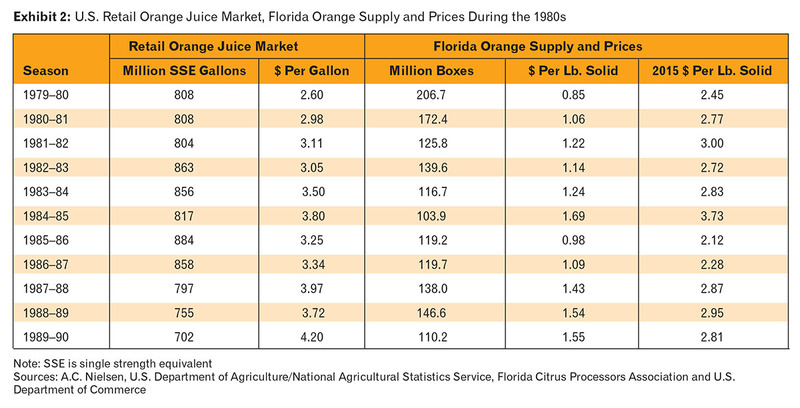 Orange juice imports, primarily from Brazil, supplemented reduced Florida orange juice supplies, and as a result of strong orange juice demand, did not denigrate prices (Exhibits 2 and 3). In 1989–90, the Florida Citrus Processors Association’s average price for early-mid and Valencia oranges was $1.55 per pound solids, which in 2017 dollars would be $2.98. So what’s going on in today’s orange juice market? Price elasticity measures the changes in consumption of a product caused by changes in its price. The price elasticity for orange juice is estimated to be -.771. That means for every 10 percent increase in orange juice prices, there will be a 7.7 percent decrease in consumption, and vice versa for decreases in prices. Income elasticity measures the changes in consumption of a product caused by changes in incomes, usually total U.S. personal disposable income adjusted for inflation. Often an increase in income is associated with increased purchases, but not always. If you get a raise, you may go buy that new car or new set of golf clubs you’ve been wanting, or have more steak and less stew meat. But would an increase in income make us more likely to buy more necessities like salt, sugar or paper towels? Probably not. What about orange juice? The income elasticity for orange juice is +0.462, meaning that for every 1 percent that inflation-adjusted, personal disposable incomes increase, 0.46 percent more orange juice will be consumed. Price elasticity measures the effect on consumption of changing only price, and not income or other variables that could affect consumption. Likewise, income elasticity measures only the effect on consumption of changing incomes and not price or any other variables. Impacts of changes in other variables like consumption trends independent of price or income, or seasonality where purchases are always higher in some months than others, are mathematically accounted for in order to isolate only the price or income effects on demand. Comparing Nielsen-measured, retail orange juice consumption and prices over the period from 2001–02 to 2016–17 (Exhibit 1), consumption declined 50.2 percent and prices increased 52.8 percent. Using a price elasticity of -.77 gives a consumption decline of 40.7 percent, not 50.2 percent. Inflation-adjusted, personal disposable incomes increased by 19.7 percent over the 2002–2017 period. At an income elasticity of .46, this 19.7 percent increase in incomes should have increased consumption by 9.1 percent over this period, holding prices constant. Combining these effects, the market should have declined by 40.7 percent because of higher prices, but increasing incomes should have increased consumption by 9.1 percent, offsetting part of that decline. So, after accounting for changes in both prices and consumer incomes, the retail orange juice market should have declined by 31.6 percent, not by 50.2 percent. Another way to look at this is that 37 percent of the 50 percent market decline was caused by factors other than high prices and reduced supplies. So if almost 40 percent of the decline in orange juice consumption isn’t because of higher prices and reduced supplies, what is causing it? I believe there are two causes of the decline in orange juice consumption other than higher prices. First, for a number of years, consumers have not been given a compelling reason to drink orange juice, and that’s resulted in orange juice consumers switching to other juices and beverages. Secondly, some nutritionists and physicians have been downplaying orange juice consumption because of its high sugar content, which they claim contributes to obesity. To give consumers a compelling reason to drink orange juice, they need to be told what is different about orange juice, and why that difference has value. Telling consumers that orange juice helps them “take on the day” does not effectively convey these messages. Coffee, tea, soft drinks and a number of other products can also help consumers “take on their day.” If changes in laws governing health claims now prevent telling consumers about the health benefits of orange juice, then a credible scientist or physician could say “orange juice is an important part of a healthy diet” as part of the advertisement, which is an opinion. 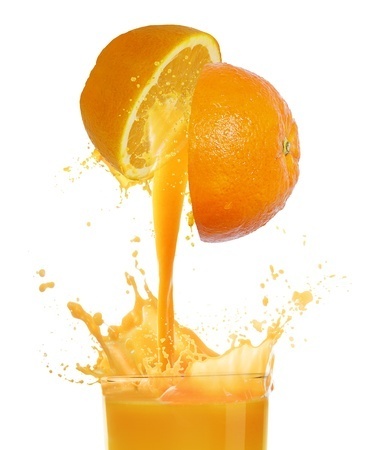 Orange juice does contain natural fruit sugars, the same as any 100-percent fruit juice. But non-diet soft drinks contain as much sugar per ounce as orange juice, and it is added sugar from other sources, which has no substantial nutritional benefits. Per-capita consumption of non-diet soda is 10 times as high as orange juice consumption, but health care professionals are not attacking soft drinks as much as orange juice. Also, orange juice has more nutrients per calorie than most other 100-percent fruit juices such as apple, grape, pineapple and prune juice3. Other nutritional attributes of orange juice that leading beverages such as soft drinks, other 100-percent fruit juices, coffee, tea, and milk do not have is that orange juice is unusually high in vitamin C and contains potassium citrate, vitamins and other compounds that may act as anti-oxidants in the body, flavonoids, folate and thiamine. These attributes may contribute to improving blood vessel functioning, reducing the risk of some birth defects, reducing LDL (the bad cholesterol), helping prevent kidney stone formation, and may have beneficial effects on blood pressure, which can help reduce the risk of cardiovascular disease. The nutritional attributes of orange juice may also help support the immune system and protect cells against free radicals, which could damage cells and tissue that could contribute to the development or progression of chronic disease. Importantly, some of these benefits, particularly those related to cardiovascular disease markers, have been demonstrated in clinical trials with orange juice4 5 6. Moreover, epidemiological research has shown that consuming orange juice compared to not consuming it is not associated with an increase in body weight in children or adults7 8. Unfortunately, these messages have not been effectively conveyed to consumers. Common sense can deflate the argument that the sugar in orange juice contributes to obesity. During the 1970s and 1980s, diet sodas that tasted good were introduced into the U.S. retail marketplace, and they became mainstream as consumers switched from caloric to non-caloric soft drinks. Currently, diet sodas account for almost half of total soft drink consumption. If sugar were the cause of obesity, almost half of the American population would have lost weight when they switched to diet sodas, but this didn’t happen. In fact, according to the Centers for Disease Control, between 1990 and 2015, the percentage of obese adults increased from 11.1 percent to 29.3 percent. This is to be expected because of the effects of aging baby boomers. So how could switching from consuming orange juice to water or lower calorie beverages prevent consumers from becoming obese when switching to diet sodas didn’t? The $450 per acre for managing HLB, mostly spraying for psyllids, will go away. Fruit yield will increase from the 211 boxes per acre that it was in 2015–16. Juice yields will increase from the current 5.95 pounds solids per box. Using the 3-year average of fruit and juice yields before HLB was found in Florida, and removing the caretaking cost of managing HLB, the delivered-in, break-even cost of producing oranges would decline from $2.50 per pound solids currently to $1.17 per pound solids. It requires an investment of about $9,000 per acre — not including the cost of the land — to replant an existing grove with HLB-resistant trees at a density of 198 trees per acre, and grow it to 4 years of age to produce a commercially harvestable crop. Adding a 10 percent required annual return to that investment increases the costs to $1.53 per pound solids. 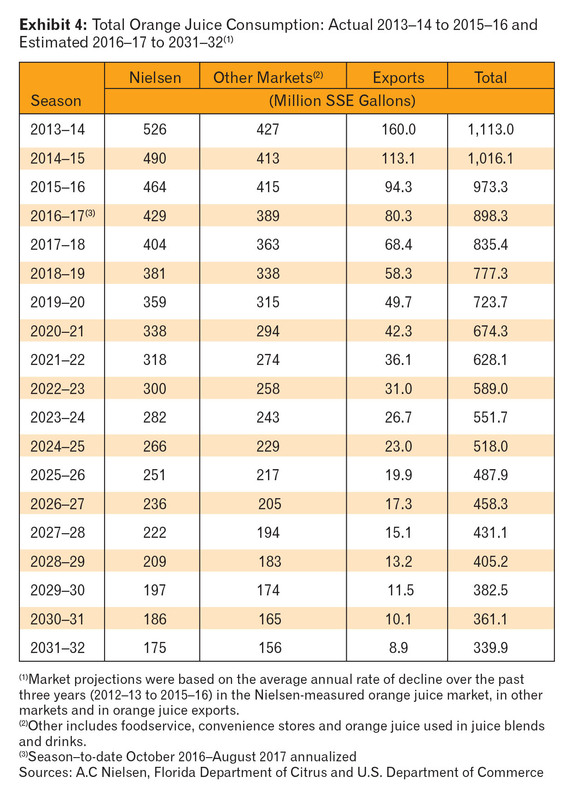 It is likely that growers would continue to increase production via new plantings until fruit prices decline from their current levels ($2.70 per pound solids last season) to that $1.53, which is a decline in fruit price of 43 percent. Increases in fruit production and lower fruit prices should result in reduced retail prices and growth in orange juice consumption. Processed orange prices currently represent about 33 percent of the price of orange juice on the store shelf. The other 67 percent of the retail price is fruit processing, warehousing, blending, packaging, distribution, and sales and marketing expenses. So 33 percent of the retail orange juice price will decline by 43 percent. That means that the current retail price of $6.71 per gallon would decline to $5.76, a decline of 14.2 percent. At a price elasticity of -.77, that would increase consumption by an estimated 11 percent. If planting of HLB-resistant trees were to start in 2019 and the first fruit is commercially harvested in 2022–23, that increase in supply would begin then and take a number of years as fruit yields increase with aging trees and additional plantings occur. However, in order to simplify the analysis, it was assumed that all of the supply increase would occur in 2022–23. Applying the estimated 11 percent increase in consumption to the total orange juice market that is projected for 2023–24 (Exhibit 4) increases that market from 552 to 613 million gallons and results in a need for 102 million boxes of oranges for processing. That assumes no orange juice imports are needed for blending to achieve brix and ratio objectives. In reality, these changes will not all happen at once. If the first HLB-resistant trees produce a harvestable crop by 2022–23, that will not be nearly enough fruit to reduce costs and increase supplies enough to make orange consumption grow. But as more HLB-resistant trees are planted, producing fruit at lower cost, the increased supply and reduced prices will ultimately stimulate growth in orange juice consumption much the way it was shown here, just over a longer period of time. Reducing fruit production costs by curing HLB will provide a price-induced increase in orange juice consumption — but only enough to profitably support an orange crop of 102 million boxes. Can this increase in consumption be increased or even sustained? Or are there underlying consumption trends that will erode this increase? Remember that 37 percent of the 50 percent Nielsen-measured orange juice market decline was caused by factors other than high prices and reduced supplies. That’s an annual decline of 1.2 percent not responsive to the economic variables of pricing or consumer purchasing power, and thus is an underlying rate of decline. The non-Nielsen orange juice market (convenience stores, restaurants, and orange juice used in juice blends and drinks) is declining faster than the Nielsen market. Its average annual decline over the most recent three years is 6.8 percent, compared to 5.8 percent for the Nielsen market. So the non-Nielsen market probably has a greater underlying rate of decline not responsive to pricing or consumer purchasing power than the Nielsen market. As I explained, I believe that consumers’ irrational concerns over the sugar content in orange juice and not being fully aware of the numerous health benefits of orange juice (there’s a lot more health benefits in orange juice than vitamin C), are the cause of this underlying market decline. But this presents a serious problem. If the impact of these non-economic variables can’t be mitigated, any increase in supplies as a result of curing HLB, and resulting lower prices that stimulate growth in orange juice consumption will ultimately be lost by the downward pressure on the market fueled by this consumer behavior. Between 1983 and 2010, the European orange juice market almost tripled in size, increasing from 506 million SSE gallons to 1.4 billion SSE gallons. However, like the U.S. orange juice market, the European market is suffering because of the negative perceptions about sugar in juice, and as a result, is becoming a scapegoat for the global obesity epidemic and consumption of excess sugar. Citrus BR, the Brazilian Citrus Exporters Association, “representing a significant portion of world orange juice supply,” has agreed to fund a European orange juice marketing campaign to be managed through AIJN. They will be joined in funding this campaign by 26 of the largest orange juice buyers/packagers in Europe. So the European fruit-juice marketing industry as well as the Brazilian orange juice exporters and European orange juice buyers/packagers are taking steps to turn their declining market around and restore them to growth. Even when a cure for HLB is implemented, unless something is done to stop the decline in orange juice consumption, the citrus-growing part of the industry will become too small to support the infrastructure of input suppliers, harvesters, grove caretakers, etc. necessary for it to function competitively. For example, assume that the lower prices from lower cost production get into the orange juice market evenly over the 2023–24 to 2031–32 nine-year period, reflecting the time required for fruit produced from new plantings of HLB-resistant trees to increasingly impact prices. Ten years after the first plantings, by 2031–32, only 58 million boxes of Florida oranges and no orange juice imports will be needed. In spite of an 11 percent increase in the orange juice market stimulated by the lower prices, the underlying rate of decline in orange juice consumption eliminated its benefit. The three major orange juice brands will probably continue mainly as juice storing, blending and packaging operations, using orange juice imported primarily from Brazil and Mexico, but also using juice from the small declining volumes of Florida fruit still available to process. However, because of the high costs of processing small volumes of fruit in the large processing plants owned by the brands and the companies processing oranges for the Coca-Cola Company’s Minute Maid and Simply brands, it is likely that one of the bulk processors may have an opportunity to process fruit for all three of the brands. This would reduce costs by processing all of the industry’s remaining volumes of oranges in one plant, and thus allow that processor to continue to operate. The bulk processors, other than the ones storing and blending juice for the Coca-Cola Company’s Minute Maid and Simply brands and the one which processes the remaining volumes of oranges, will soon have no economic reason to exist in Florida. Private labels’ orange juice needs will be supplied by imports, primarily from Brazil and Mexico. Because of the declining U.S. orange juice market, the brands will probably increase their focus on the European orange juice market, which, as was pointed out, is being positioned to grow. There will also probably be a proliferation of exotic juice blends like blueberry mango, pomegranate limeade, strawberry banana, watermelon, berry greens, etc. being introduced by the brands as they begin to position themselves away from citrus. This conclusion doesn’t have to happen. But it is likely to happen if something isn’t done to restore the U.S. orange juice market to growth. One way to fund that is to partner with Citrus BR the way AIJN and the European orange buyers/packagers are doing. The U.S. orange juice market is second only to Europe in importance to Brazil as an export market for its orange juice. If approached, the Brazilians would probably be interested in working with the Florida Citrus Commission the way they are working with AIJN to restore growth to the U.S. orange juice market. Allen Morris was an associate Extension scientist and economist in the University of Florida’s Food and Resource Economics Department from 2007–2012 at the Citrus Research and Education Center in Lake Alfred. 1 Morris, Allen. “Demand for Orange Juice, Blends and Drinks: A Comparison Between 1988–1997 to 2005–2010,” University of Florida/Institute of Food and Agricultural Sciences, Citrus Research and Education Center, Lake Alfred, Florida, September 4, 2010. 3 Rampersaud, Gail C. “A comparison of nutrient density scores for 100 percent fruit juices.” Journal of Food Science, Vol. 72, No. 4, 2007. 4 Basile, L.G., Lima, C.G., Cesar, T.B. “Daily Intake of Pasteurized Orange Juice Decreases Serum Cholesterol, Fasting Glucose, and Diastolic Blood Pressure in Adults.” Proc. Fla. State Hort. Soc. 2010; 123: 228–233. 5 Cesar, T.B, Aptekmann, N.P., Araujo, M.P., Vinagre, C.C., Maranhao, R.C. “Orange juice decreases low-density lipoprotein cholesterol in hypercholesterolemic subjects and improves lipid transfer to high-density lipoprotein in normal and hypercholesterolemic subjects.” Nutrition Research. 2010; 30 (10): 689-694. 6 Morand, C., Dubray, C., Milenkovic, D., Lioger, D., Martin, J.F., Scalbert, A., Mazur, A. “Hesperidin contributes to the vascular protective effects of orange juice: a randomized crossover study in healthy volunteers.” Am J Clin Nutr. 2011; 93 (1): 73-80. 7 O’Neil, C.E., Nicklas, T.A., Rampersaud, G.C., Fulgoni III, V.L. “One hundred percent orange juice consumption is associated with better diet quality, improved nutrient adequacy, and no increased risk for overweight/obesity in children.” Nutrition Research; 2011; 21(9): 673-682. 8 O’Neil, C.E., Nicklas, T.A., Rampersaud, G.C., Fulgoni III, V.L. “100 percent orange juice consumption is associated with better diet quality, improved nutrient adequacy, decreased risk for obesity, and improved biomarkers of health in adults.” National Health and Nutrition Examination Survey, 2003-2006. Nutrition Journal; 2012; 11:107 (December 2012).